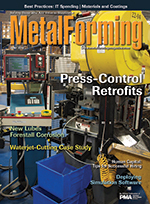 A 3-yr. plan to upgrade high-speed press lines at this fastener manufacturer pays off handsomely, as it's been able to evolve from operating in "scramble mode" into a facility so finely tuned that productivity has soared by 40 percent, and management is pushing to increase run rates another 25 to 30 percent. The desire of automotive OEMs and their suppliers to protect high-strength and coated-steel stamped parts from corrosion has many switching to neat oils and emulsions. Still using water-based lubes? Follow the tips offered here to forestall corrosion. A 10- by 40-ft. dual-bridge cutting table, twin pumps and productivity-enhancing processing software fortify this waterjet-cutting machine to tackle parts to 1.5 in. thick, helping a startup manufacturer of lumber-cutting machines make a mark in the market. ...but never ignore the common practices offered here to ensure a failsafe design that provides safe die retention regardless of operating conditions. ...is the safety net die shops use when walking whats become a high-risk high-wire act to design and develop dies for high-strength automotive steel structures. The margin for error is nearly zero. Where are All the Tinkerers? Stamping is No GoodWho Gets the Blame? Am I Paying Too Much for IT?